Trees, branches and foliage of Gaudi’s modernisme architecture. Click on any photo to see a larger version of that photo. 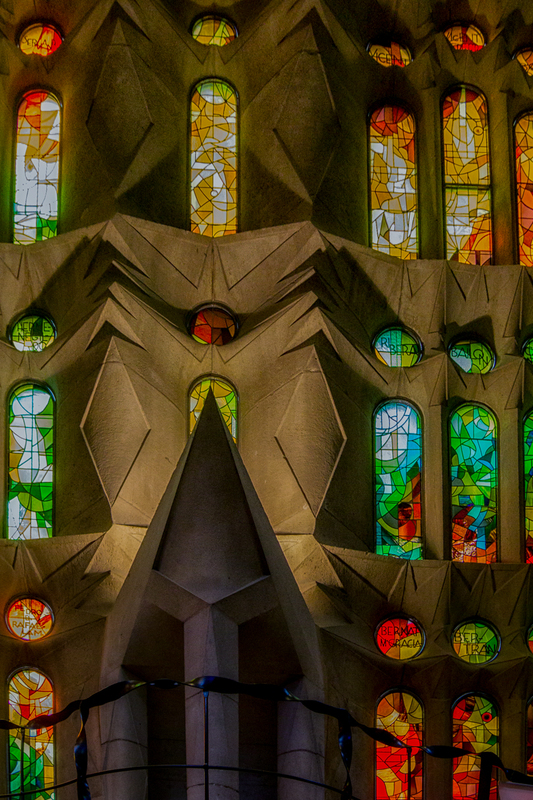 Construction began on the church in 1882 and the young Gaudi took over in 1883 at the age of 31. 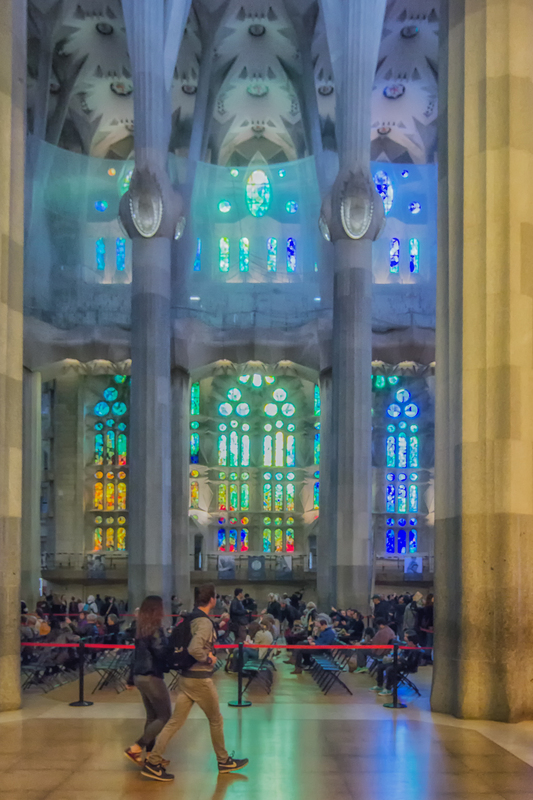 The design of La Sagrada Familia was a part-time job for the next 37 years as Gaudi extended his career by designing many structures for his patron Eusebi Güell and a few mansions for other wealthy Barcelonans. 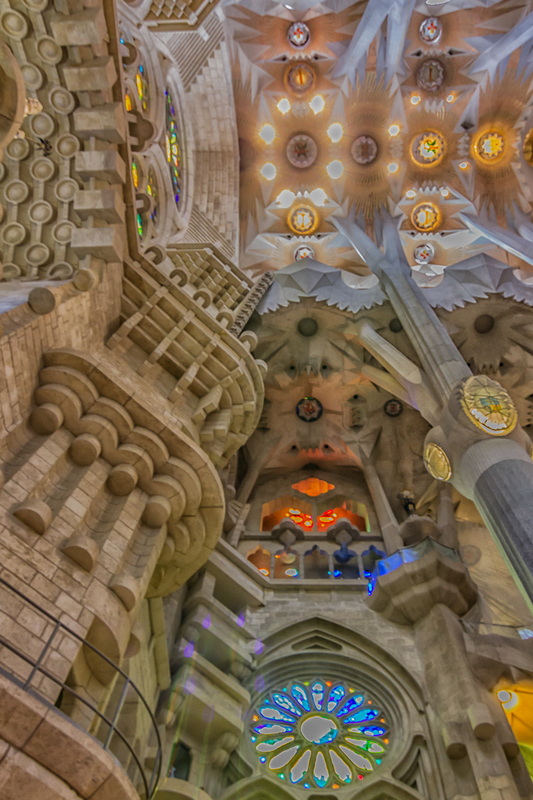 Then in 1914 his Colonia Güell project was finally abandoned and then Gaudi spent the last twelve years of his life building La Sagrada Familia. He died in 1926 but his associates continued his project using his design. In 1936 at the onset of the Spanish Civil War a group of anarchists attacked the church and destroyed his workshop including most of his drawings, plans and models. There was hardly any progress on the church until the 1950s when a renewed effort by a new generaton of architects and builders augmented by a world-wide foundation of donors came together to plan a completion of the building according to Gaudis’ vision by 2026, the hundredth anniversary of his death. When the Christ-spire, the last of 18 towers, is installed the church will become the tallest religious structure in the world. A little bit of everything in this shot! Nave and side aisle pillars. More trees, branches and foliage. St George overlooks the portal of the unfinished Glory Facade. Gaudi spent ten years designing his unfinished church at Colonia Güell, working with bricks and stone and trencadis to blend the Gothic architecture of the last 500 years with his version of the modernisme architecture that included his favorite geometric shapes — helicoids, ellipsoids, conoids, hyperboloids and his favorite of all, hyperbolic paraboloids. 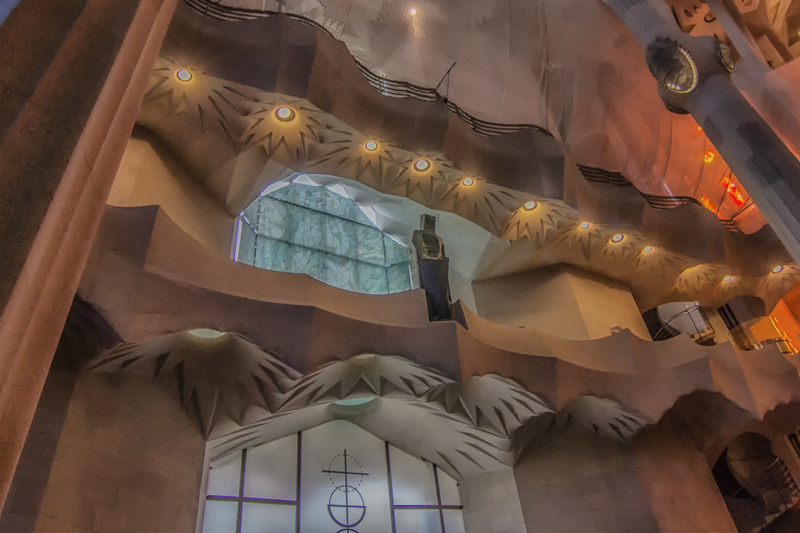 Gaudi’s three-dimensional model of the church at Colonia Güell was destroyed in 1936 but a copy was produced from various sources and is now displayed in the museum below La Sagrada Familia. 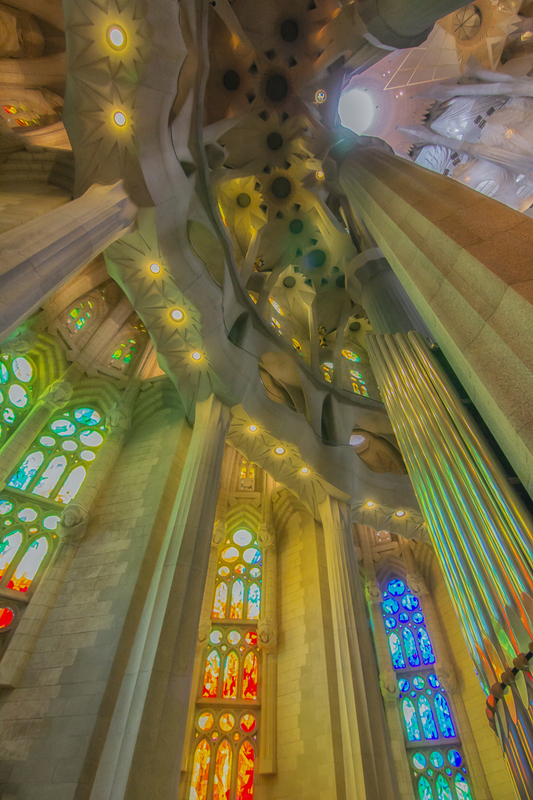 In his model Gaudi placed packets of birdshot on pieces of string to form various catenary curves. 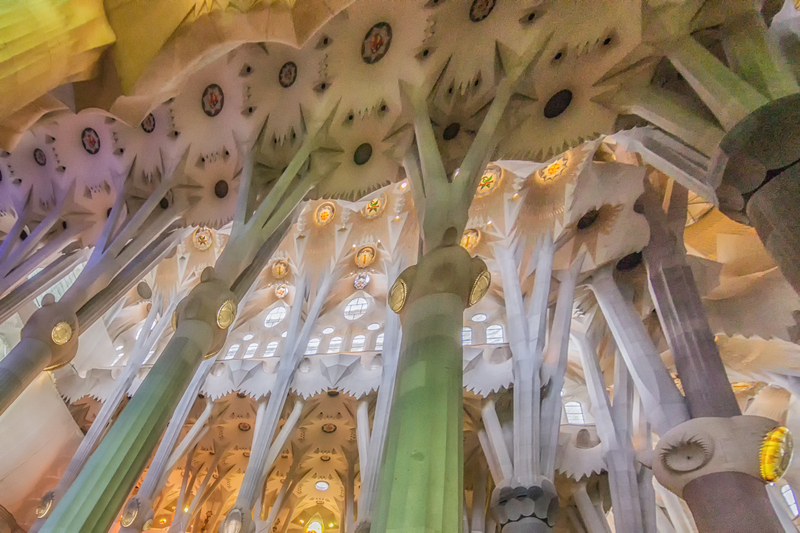 Then he would photograph his models and turn them upside down and –voila!– he produced the arches for his brick vaulted ceiling at Colonia Güell. 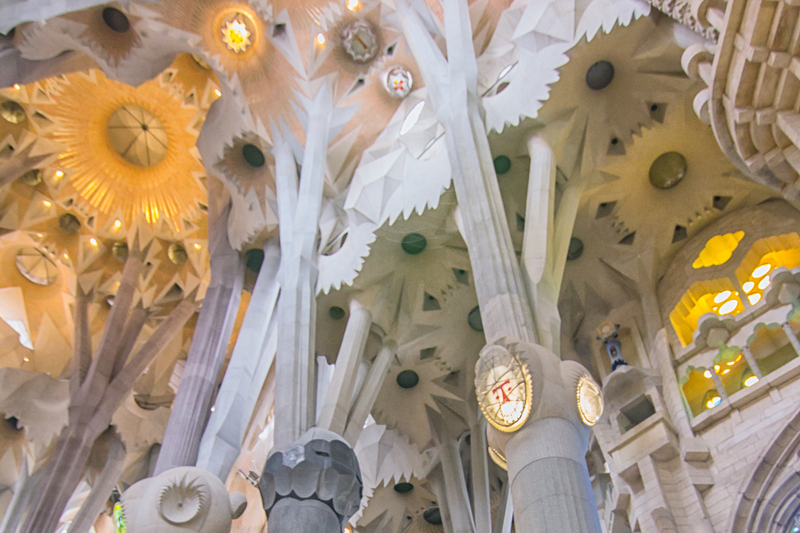 The branches of his tree-pillars in La Sagrada Familia were designed in a similar fashion. 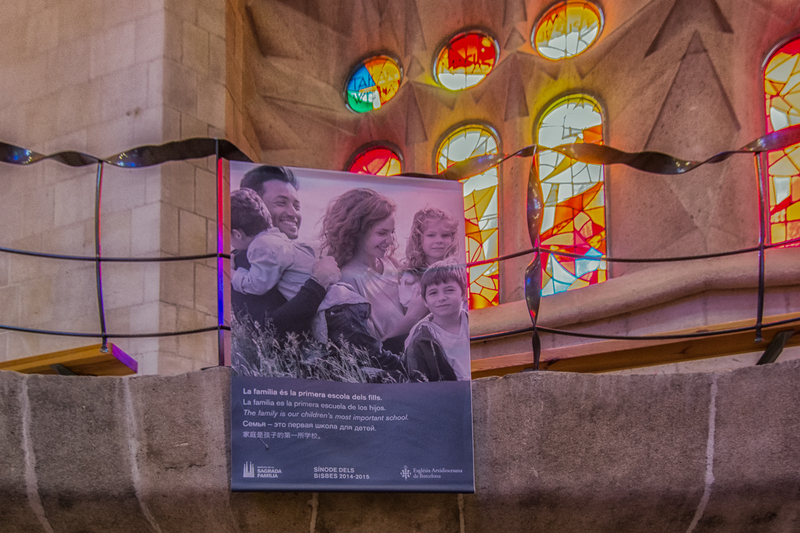 There are several posters depicting family life along the balconies. The ellipsoids on the pillars represent scars from sawed-off tree branches. Balcony and stained glass windows. Dome and crucifix over main altar. 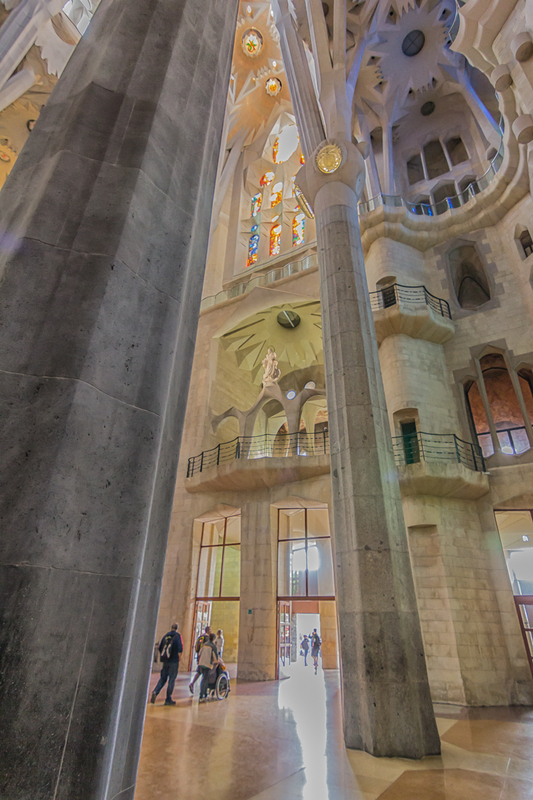 Side aisles and crossing near the Passion Facade entrance. 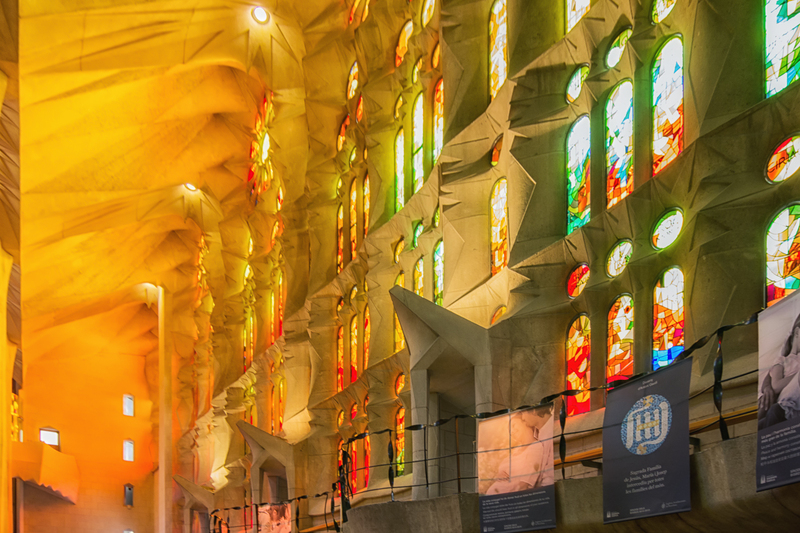 Gaudi was somewhat of a dandy in his youth and he wore fancy clothes and frequented popular bars and restaurants. He then went through some sort of religious transformation and spent the rest of his life as a vegetarian and ascetic with no interest either in his own appearance or in mingling with society. He never married and had few friends. With every breath he took he was obsessed with the design of his church for his God. One day in June of 1926 he was run over by a tram while on his way to work. Because of his unkempt and ragged appearance he was mistaken for a homeless tramp and placed in a hospital for the poor where he died three days later. He is now buried in the crypt of La Sagrada Familia and there is a movement ongoing to have Pope Francis declare him a saint. The view between two pillars. The church will be the tallest in the world when it is completed. 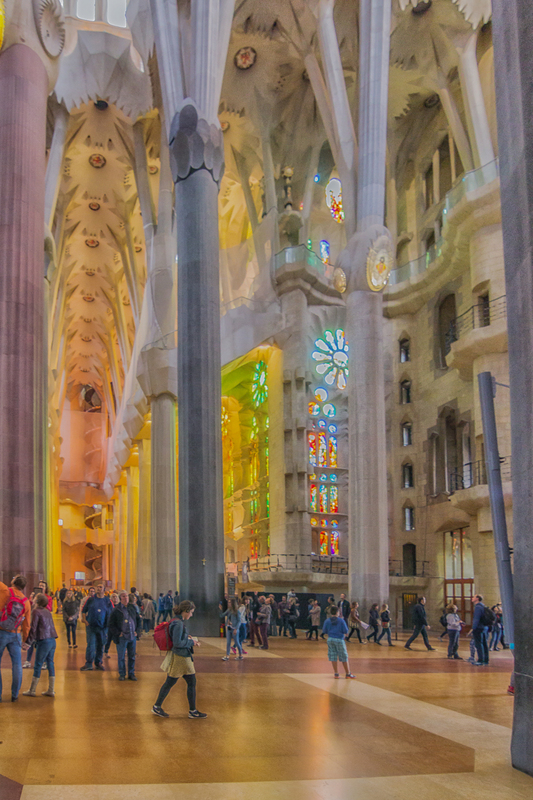 Some portions of the church explode in yellows and oranges while others are blue and green and yet others pink and purple. 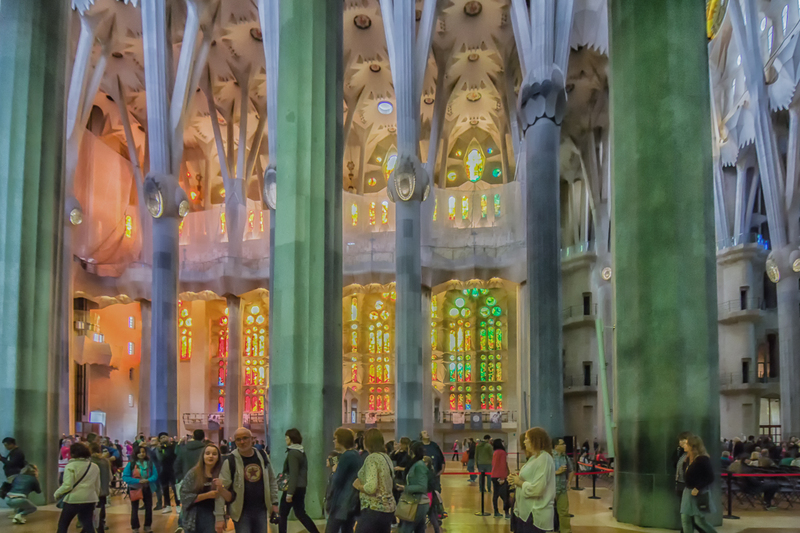 Only once did Pope Benedict XVI venture outside Italy during his reign to consecrate a basilica and that was in 2010 when he came to Barcelona to celebrate the first Mass at La Sagrada Familia. Seven thousand people attended the Mass including a choir of more than 800. See here for a 16-minute video of the occasion and hear the music of Puccini’s Nessun Dorma, Chopin’s E-Flat Nocturne and Schubert’s Ave Maria. Ceiling hyperboloids, paraboloids and catenary arches. This tower staircase is a perfect helicoid. 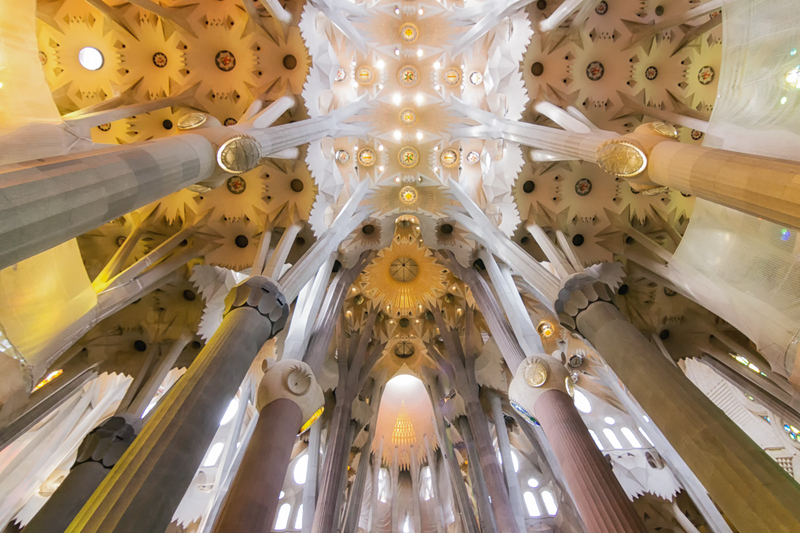 For those who may be interested in Gaudi’s geometric shapes the La Sagrada Famila Foundation has developed several short videos — each of them about two minutes long — to explain how he used them in his design for La Sagrada Familia. See here for the helicoid, here for the catenary, here for the conoid, here for the hyperboloid, and here for the paraboloid. 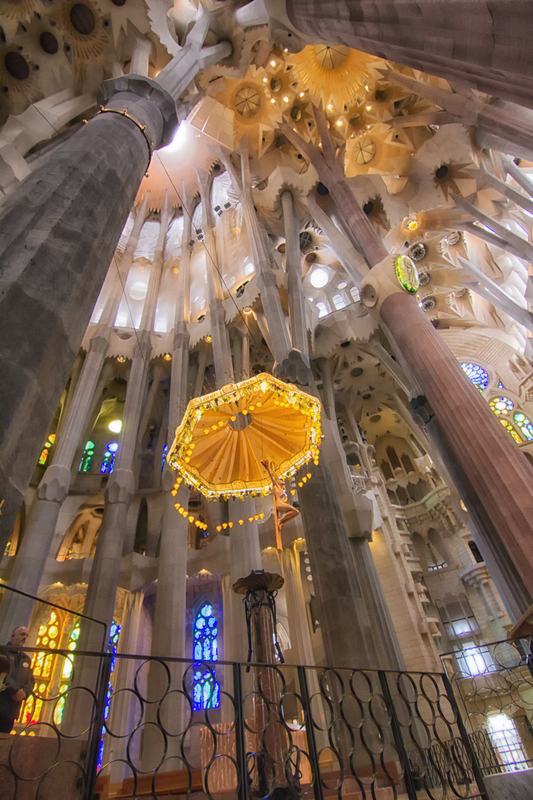 Seven of Gaudi’s works, including La Sagrada Familia, have been declared UNESCO World Heritage Sites. 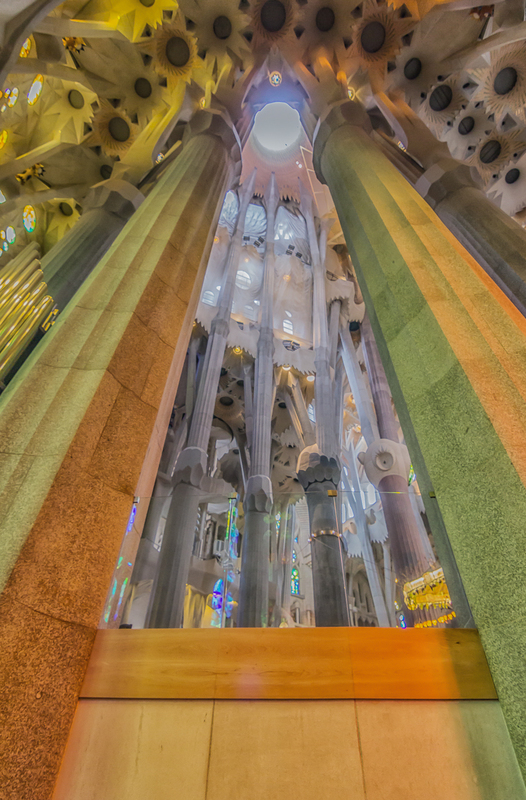 This entry was posted in Architecture, Barcelona, Biography, Spain, Travel and tagged Antoni Gaudi, architectural photography, church photography, La Sagrada Familia, modernisme, photography, travel, travel photography. Bookmark the permalink. Very interesting. Happy Easter to you as well. 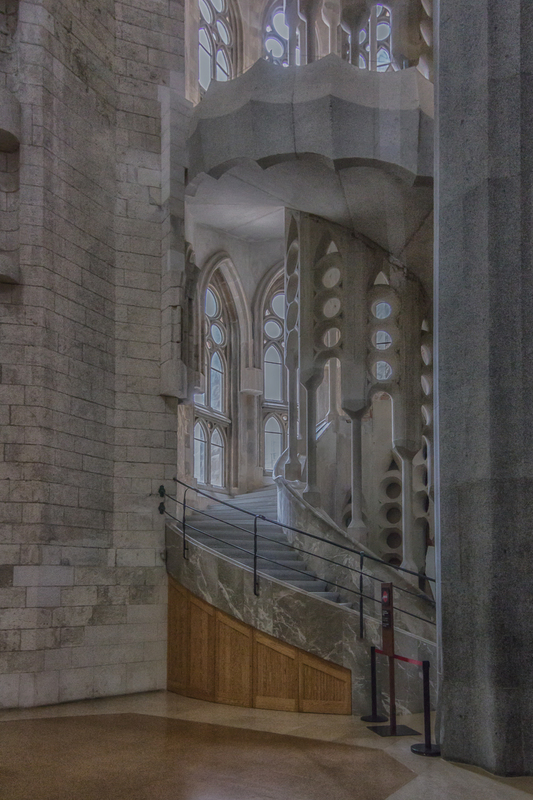 I’ve seen many images of the exterior of the church, but these are the first interior shots – they are stunning. Thanks for posting them. I enjoyed your post and your different perspective on the building.